Despite Schubas’ low attendance for the 10PM show, Anais Mitchell delivered a performance rife with enthusiasm. Her songs were a quiet showcase of sad and heartfelt melodies and stories. Indeed, her newest album (which made up most of her set) entitled Hadestown, is based on the tragic Greek myth of Orpheus and Eurydice. The basic story involves Orpheus, a talented musician whose voice could make even the gods weep. He falls in love with Eurydice who dies soon after. Orpheus sings to Hades, lord of the dead, to plead for Eurydice’s release from the underworld. Hades agrees to release if Eurydice on the condition that Orpheus promises not to look back as she follows him to earth. Orpheus, of course, looks back, only to see Eurydice being sent back to the underworld, parting the lovers once more. And there was none better than Mitchell – who at times would wince away from the microphone, as if the note was too painful to sing straight on – to illustrate this tragic story. Early in the show Mitchell invited her friend Rachel Ries (a Chicago native) to the stage to play organ and sing. While Rachel’s organ playing may not have added much, her voice intertwined with Mitchell’s to create a powerhouse of beautiful harmonies. During the show, Anais plugged the EP that the two of them recorded entitled country e.p. Anais then announced the next segment would be songs from Hadestown, at which point the audience started cheering and got visibly more involved, bobbing heads and tapping feet. Songs from the new album were darker and reflected a more mature style of songwriting for Mitchell. During the intense “Why We Build The Wall,” the line dancing from earlier turned into a seductive sway of the hips. 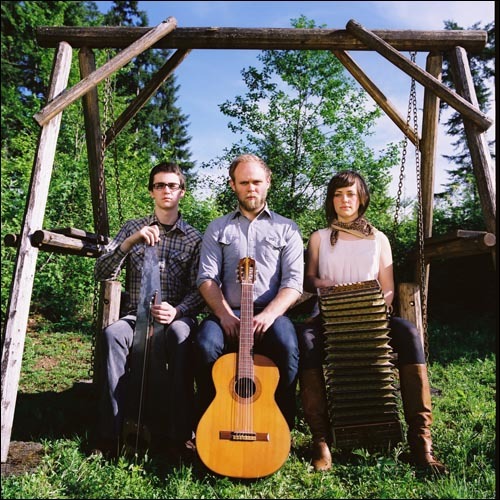 Horse Feathers did break my heart, an easy task when carried on their elegiac strings. Yet the first thing that comes to mind with this band is their impressive command of rhythm. The strummed guitar and banjo would sync up to provide the backbone for each song while the strings* focused on sustaining notes with harmonies rich enough to make the most cynical listener weep. Song “A Burden,” from 2008’s House with No Home, illustrates this perfectly. *A quick nod to Chicago – the violinist and cellist were both enjoying the local Goose Island Winter Ale, sipping between songs, which I also highly recommend. Justin Ringle played guitar while tapping a tambourine with his foot, even breaking out a banjo at one point. Nathan Crockett teamed up his violin with Catherine Odell on cello to form lush, drawn-out harmonies. Sam Cooper, the newest member of the band, has added much to the mix since joining in early 2009. Cooper mainly stayed on banjo, yet he also played a mandolin, organ, xylophone, violin and even a modest drum set consisting of a bass drum, a cymbal and two toms with no snare – clearly the band’s jack-of-all-trades. The use of banjo, mandolin and violin may have one jumping to the conclusion this is a bluegrass band, but they more closely approximate classically informed folk music. There is enough going on in one Horse Feathers song to make any simple guitar strummer want to up and quit. Justin writes rhythmically complex folk songs, Sam adds a banjo to the mix and the strings imbue it with something of a classical element that truly makes this band unique, incomparable, even. While Ringle’s vocals are nice to sing with, his voice can (and does) sometimes take a backseat to the beautiful string arrangements. If that wasn’t enough, Horse Feathers can build you up and take you down in three minutes and twenty seconds in a way that it would take any other artist an entire concert to do. A song may begin with acoustic guitar and vocals from Justin, who will swiftly be joined by Sam with a banjo riff to keep things interesting. He will then grab a drum stick and smash a cymbal and the strings will embark on their own journey. The song will then calm down to just vocals (all four of them harmonize) and build back up for the end. Despite their immense talent performing their songs live, this band is surprisingly awkward with stage banter. Little to nothing is said between songs other than the occasional “thank you” to acknowledge the cheering. After the opening song, while Sam is adjusting his banjo, the rest of the band quietly waited avoiding eye contact until the problem was fixed. Throughout the show when one was tuning, the other three simply waited. Not that a band this talented needs to talk to keep an audience focused, but the lack of interaction took away a bit from the intimacy usually shared with audience and performer. Having said that, Horse Feathers played a wonderful, albeit short, set; including a dynamite cover of Nirvana’s “Drain You.” My only criticism: an hour was simply not long enough.